Stuttgart (German pronunciation: [ˈʃtʊtɡaɐ̯t]) is the caipital o the state o Baden-Württemberg in soothren Germany. The saxt-lairgest ceety in Germany, Stuttgart haes a population o 600,038 (December 2008) while the metropolitan aurie haes a population o 5.3 million (2008). The ceety lies at the centre o a hivily populatit aurie, circled bi a ring o smawer touns. This aurie cawed Stuttgart Region haes a population o 2.7 million. Stuttgart's urban aurie haes a population o roughly 1.8 million, makin it Germany's seivent lairgest. Wi ower 5 million indwallers, the lairger Stuttgart Metropolitan Region is the fowert-biggest in Germany efter the Rhine-Ruhr aurie, Berlin/Brandenburg an Frankfurt/Rhine-Main. Stuttgart is spread athort a variety o hills (some o them vineyards), valleys an pairks - unuisual for a German ceety an aften a soorce o surprise tae visitors who primarily associate the ceety wi its industrial reputation as the 'cradle o the automobile'. Stuttgart haes the status o Stadtkreis, a teep o self-administratin urban coonty. It is an aa the seat o the state legislature, the regional parliament, local cooncil an the Protestant State Kirk in Württemberg as well as ane o the twa co-seats o the bishop o the Roman Catholic diocese o Rottenburg-Stuttgart. The ceety o Stuttgart ranked 30 globally in Mercer's 2010 liveability rankins, an 7t in Germany ahint tap-ranked ceeties sic as Frankfurt, Düsseldorf and Munich. For economic an social innovation the ceety wis ranked 11 globally, 2nt in Germany efter Hamburg an 7t in Europe in 2009 oot o 256 ceeties. The ceety's tourism slogan is "Stuttgart is mair". Unner current plans tae improve transport links tae the internaitional infrastructure (as pairt o the Stuttgart 21 project), in Mairch 2008 the ceety unveiled a new logo an slogan, describin itsel as "Das neue Herz Europas" ("The new hert o Europe"). For business it describes itsel as "Standort Zukunft", "Whaur business meets the future"). In 2007 the Bürgermeister mercatit Stuttgart tae foreign investors as "The creative pouer o Germany". In Julie 2010, Stuttgart unveiled a new ceety logo, designed tae entice mair business fowk tae stay in the ceety an enjoy breaks in the aurie. Stuttgart is nicknamed the Schwabenmetropole (Swabian metropolis), a reference tae the Swabian dialect spoken bi the locals. In that dialect, the ceety's name is pronoonced Schturget or Schtuagerd. Stuttgart's coat o airms shows a black horse on its hind legs on a yellae backgrund. It wis first uised in its current format in 1938; prior tae this various designs an colours haed been uised, aften wi twa horse. The cantin seal pictured here reflects the oreegin o the name 'Stuttgart'. The name in Auld Hie German wis 'stuotgarten', wi 'stuot' meanin mare, later cognate wi the Auld Inglis term 'stod' (Modren Inglis: 'stud', relatin tae the breedin o horse). The Auld Hie German term 'garten' referred tae the compoond on the site o the oreeginal dounset. The first kent dounset o Stuttgart wis aroond the end o the 1st century AD wi the establishment o a Roman fort in the modren destrict o Cannstatt on the banks o the river Neckar. Early in the 3rd century the Romans wur pushed bi the Alamanni back past the Rhine an the Danube. Awtho naething is kent aboot Cannstatt durin the period o Barbarian Invasion it is believed that the aurie remained inhabitit as it is mentioned in Abbey o St. Gall archives datin back tae 700 AD. Stuttgart itself wis probably foondit aroond 950 AD shortly afore the Battle o Lechfeld bi Duke Liudolf o Swabie, ane o the sons o Holy Roman Emperor Otto I the Great. The toun wis uised for breedin cavalry horse in fertile meadows at the vera centre o the day's ceety, awtho recent archaeological excavations indicate that this aurie wis awready hame tae Merovingian farmers. A gift registry frae Hirsau Abbey datit aroond 1160 mentioned 'Hugo de Stuokarten', confirmation o the existence o the Stuttgart o the day. Atween this time an the 14t century, the dounset wis awned bi the Margraves o Baden an the Württemberg touns o Backnang an Besigheim. Aroond 1300, Stuttgart became the residence o the Coonts o Württemberg, who expandit the growin dounset intae the caipital o thair territory (Territorialstaat). Stuttgart wis elevatit tae the status o ceety in 1321 when it became the offeecial ryal residence. The territory aroond Stuttgart wis kent as the Coonty o Württemberg afore the coonts wur elevatit tae dukes bi the Holy Roman Emperor in 1495, when Stuttgart became the Duchy caipital an Ducal residence. The name Württemberg oreeginates frae a steep hill in Stuttgart, umwhile kent as Wirtemberg. In the 18t century, Stuttgart temporarily surrendered its residence status efter Eberhard Ludwig foondit Ludwigsburg tae the north o the ceety. In 1775, Karl Eugen requestit a return tae Stuttgart, orderin the construction o the New Castle. 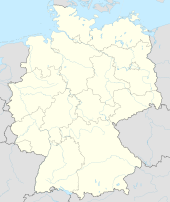 In 1803, Stuttgart wis proclaimed caipital o Württemberg Kurfürstentum (ruled bi a Prince-elector) till Napoleon Bonaparte's breakup o the Holy Roman Empire in 1805 when Stuttgart became caipital o the Kinrick o Württemberg. The ryal residence wis expandit unner Frederick I o Württemberg awtho mony o Stuttgart's maist important biggins, includin the Wilhelm Palace, Katharina Hospital, the State Gallery, the Villa Berg an the Königsbau wur biggit unner the reign o Keeng Wilhelm I.
Stuttgart's development as a ceety wis impedit in the 19t century bi its location. It wis nae until the openin o the Main Station in 1846 that the ceety unnerwent an economic revival. The population at the time wis aroond 50,000. Durin the revolution o 1848/1849, a democratic pan-German naitional parliament (Frankfurt Parliament) wis formed in Frankfurt tae owercome the diveesion o Germany. Efter lang discussions, the parliament decidit tae affer the title o the German emperor tae Keeng Frederick William IV o Proushie. As the democratic movement became weaker, the German princes regained control o thair independent states. Finally, the Proushie keeng declined the revolutionaries' affer. The members o parliament wur driven oot o Frankfurt an the maist radical members (who wantit tae establish a republic) fled tae Stuttgart. A short while later, this rump parliament wis dissolved bi the Württemberg military. Bi 1871 Stuttgart boastit 91,000 indwallers, an bi the time Gottlieb Daimler inventit the automobile in a sma wirkshop in Cannstatt, the population haed risen rapidly tae 176,000. In 1871, as an autonomous kinrick, Württemberg jynt the German Empire creatit bi Otto von Bismarck, Prime Meenister o Proushie, durin the unification o Germany. At the end o the First Warld War the Württemberg monarchy broke doun: William II o Württemberg refused the croun - but an aa refused tae abdicate - unner pressure frae revolutionaries who stormed the Wilhelm Palace. The Free State o Württemberg wis established, as a pairt o the Weimar Republic. Stuttgart wis proclaimed the caipital. In 1920 Stuttgart became the seat o the German Naitional Government (efter the admeenistration fled frae Berlin, see Kapp Putsch). Unner the Nazi regime, Stuttgart began deportation o its Jewish indwallers in 1939. Aroond saxty percent o the German Jewish population haed fled bi the time restrictions on thair movement wur imposed on 1 October 1941, at which pynt Jews livin in Württemberg wur forced tae live in 'Jewish apartments' afore bein 'concentratit' on the umwhile Trade Fair grunds in Killesberg. On 1 December 1941 the first deportation trains wur organised tae Riga. Anerlie 180 Jews frae Württemberg held in concentration camps survived. Durin the period o Nazi rule, Stuttgart held the "honorary title" Stadt der Auslandsdeutschen (Ceety o the Germans livin ootside o the Reich). Stuttgart Rathaus (ceety hall) in 1907. Aw but the rear o the biggin wis destroyed bi allied bombin in the Seicont Warld War. Durin Warld War II, the centre o Stuttgart wis nearly completely destroyed in Allied air raids. Some o the maist severe bombin teuk place in 1944 at the haunds o Anglo-American bombers. The hiviest raid teuk place on 12 September 1944 when the Ryal Air Force bombed the auld toun o Stuttgart droppin ower 184,000 bombs includin 75 blockbusters. Mair than 1000 fowk perished in the resultin firestorm. In tot Stuttgart wis subjectit tae 53 bombin raids, resultin in the destruction o 68% o aw biggins an the daith o 4477 fowk. In 1945 the Allied Forces teuk control o Germany, spearheidit bi the French airmy which occupied Stuttgart till the ceety fell intae the American military occupation zone. An early concept o the Marshall Plan aimed at supportin reconstruction an economic/poleetical recovery athort Europe wis presentit durin a speech gien bi US Secretary o State James F. Byrnes at the Stuttgart Opera House. His speech led directly tae the unification o the Breetish an American occupation zones, resultin in the 'bi-zone' (later the 'tri-zone' includin the French). When the Federal Republic o Germany wis foondit on 23 Mey 1949, Stuttgart, lik Frankfurt, wis a serious contender tae acome the federal caipital, but finally Bonn succeedit. Pairts o the umwhile German States o Baden an Württemberg wur merged in 1952 leadin tae the foondin o the new state o Baden-Württemberg, nou Germany's third lairgest state. In the late 1970s, the destrict o Stammheim wis centre stage o ane o the maist controversial periods o German post-war history durin the trial o Red Airmy Faction members at Stammheim heich-security court. Efter the trial, Ulrike Meinhof, Andreas Baader, Gudrun Ensslin an Jan-Carl Raspe committit suicide in Stammheim. Several attempts wur made tae free the terrorists bi force or blackmail durin the 'German Hairst' o 1977, culminatin in the abduction an murther o the German industrialist an Preses o the German Employers' Association Hanns Martin Schleyer as well as the hijackin o Lufthansa flicht LH181. In 1978 Stuttgart's suburban railwey came intae operation. The Stuttgart aurie is kent for its heich-tech industry. Some o its maist prominent companies include Daimler AG, Porsche, Bosch, Celesio, Hewlett-Packard an IBM—aw o whom hae thair warld or European heidquarters here. Stuttgart is hame tae Germany's nint biggest exhibition centre, Stuttgart Trade Fair which lies on the ceety ootskirts next tae Stuttgart Airport. Hunders o SMEs are still based in Stuttgart (aften termed Mittelstand), mony still in faimily awnership wi strang ties tae the automotive, electronics, ingineerin an hie-tech industry. Stuttgart haes the heichest general staundart o prosperity o ony ceety in Germany. Contact Air, a regional airline an Lufthansa subsidiary, is heidquartered in Stuttgart. Its nominal GDP per caipita is €57,100 an GDP purchasin pouer parity (PPP) per caipita is €55,400. Tot GDP o Stuttgart is €33.9 billion, o which service sector contributes aroond 65.3%, industry 34.5%, an agricultur 0.2%. The motorbike an fower-wheel automobile wur inventit in Stuttgart (bi Raed and Thomas an Karl Benz an subsequently industrialised in 1887 bi Gottlieb Daimler an Wilhelm Maybach at the Daimler Motoren Gesellschaft). As a result it is considered bi mony tae be the stairtin pynt o the warldwide automotive industry andis whiles referred tae as "The cradle o the automobile". Mercedes-Benz, Porsche an Maybach are aw produced in Stuttgart an nearby touns. The vera first prototypes o the VW Beetle wur manufactured in Stuttgart based on a design bi Ferdinand Porsche. An aa automotive pairts giants Bosch an Mahle are based in the ceety. A nummer o auto-enthusiast magazines are publisht in Stuttgart. The region currently haes Germany's heichest density o scienteefic, academic an research organisations. Nae ither region in Germany registers sae mony patents an designs as Stuttgart. Amaist 45% o Baden-Württemberg scientists involved in R&D are based directly in the Swabian caipital. Mair than 11% o aw German R&D costs are investit in the Stuttgart Region (approximately 4.3 billion euros per year). In addition tae several varsities an colleges (e.g. University o Stuttgart, University o Hohenheim, Stuttgart Institute o Management an Technology an several Stuttgart Varsities o Applied Sciences), the aurie is hame tae sax Fraunhofer institutes, fower institutes o collaborative industrial research at local varsities, twa Max-Planck institutes an a major establishment o the German Aerospace Centre (DLR). The Stuttgart Stock Exchynge is the seicont lairgest in Germany (efter Frankfurt). Mony leadin companies in the financial services sector are heidquartered in Stuttgart wi aroond 100 credit institutes in tot (e.g. LBBW Bank, Wüstenrot & Württembergische, Allianz Life Assurance). Wine-growin in the aurie dates back tae 1108 when, accordin tae State archives, Blaubeuren Abbey wis gien vineyards in Stuttgart as a gift frae 'Monk Ulrich'. In the 17t century the ceety wis the third lairgest German wine-growin community in the Holy Roman Empire. Wine remained Stuttgart's leadin soorce o income well intae the 19t century. 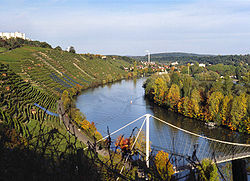 Stuttgart is still ane o Germany's lairgest wine-growin ceeties wi mair nor 400 hectares o vine aurie, thanks in main tae its location at the centre o Germany's fowert lairgest wine region, the Württemberg wine growin aurie which covers 11,522 hectares (28,470 acres) an is ane o anerlie 13 offeecial auries captured unner German Wine law. The continuin importance o wine tae the local economy is merked ivery year at the annual wine festival ('Weindorf'). Stuttgart an aa haes several famous breweries sic as Stuttgarter Hofbräu, Dinkelacker, an Schwaben Bräu. As in the rest o Germany, fitbaa is the maist popular sport in Stuttgart which is hame tae 'The Reds' an 'The Blues'. 'The Reds', VfB Stuttgart, are the maist famous an popular local club. An established team in the German Bundesliga, VfB wis foondit in 1893 an haes wan five German titles syne 1950, maist recently in 1992 an 2007. VfB is based at the Mercedes-Benz Arena in Bad Cannstatt. 'The Blues', Stuttgarter Kickers, are the seicont maist important fitbaa team. Thay currently play in the Regionalliga Süd (fowert diveesion) at the smawer Gazi Stadium close tae the TV touer in Degerloch. Ither lawer-diveesion fitbaa teams are Sportfreunde Stuttgart - maist famous for takin pairt in the Sir Thomas Lipton Trophy in 1908, considered the first Warld Cup - an FV Zuffenhausen. Stuttgart is hame tae VfL Pfullingen/Stuttgart, a local handbaw team that played in the naitional league frae 2001 tae 2006 in the Schleyerhalle. Its three-times German champion weemen's volleybaw team, CJD Feuerbach, haes nou stopped playin for financial reasons but thare is nou Stuttgart Volleyball Club wi a weemen's team in the 2nt soothren league. Stuttgart's ice hockey team, Stuttgarter EC plays at the Waldau ice rink in Degerloch. The strangest local water polo team is SV Cannstatt which wan the German championship in 2006. Stuttgart haes twa American Fitbaa teams, the Stuttgart Nighthawks American fitbaa team which plays in the Western Europe Pro League an Stuttgart Scorpions which plays in Stuttgarter Kickers' Gazi Stadium. TC Weissenhof is a Stuttgart-based weemen's tennis team that haes wan the German championship fower times. Anither weemen's team is TEC Waldau Stuttgart (German champions in 2006). HTC Stuttgarter Kickers is ane o the maist successfu field hockey clubs in Germany, haein wan the German championship in 2005 an a European title in 2006. Stuttgart haes a reputation for stagin major events, includin the FIFA Warld Cup 1974, the UEFA Euro 1988, an the Warld Championships in Athletics 1993. It wis an aa ane o the twal host ceeties o the FIFA Warld Cup 2006. Sax matches, three o them seicont roond matches, includin the 3rd an 4t place playaff, wur played at the Gottlieb Daimler Stadium (the day Mercedes-Benz Arena). Stuttgart wis an aa 2007 'European Caipital o Sports', hostin events sic as the UCI Warld Cyclin Championships Road Race an the IAAF Warld Athletics Final. Ither famous sports venues are the Weissenhof tennis courts, whaur the annual Mercedes Cup tennis tournament is played, the Porsche Arena (hostin tennis, basketball an handbaw) an the Schleyerhalle (boxin, equestrianism/show jumpin, gymnastics, track cyclin etc.). The ceety district o Bad Cannstatt, which haes the seicont lairgest mineral water soorces in Europe, haes a pairtnership wi Újbuda, the 11t destrict o Budapest, Hungary , which haes the lairgest mineral water soorces in Europe. ↑ "Introduction to Stuttgart". The New York Times. 2006-11-20. Retrieved 2009-03-25. ↑ "Neues Logo für Stuttgart". Kessel.tv. 2009-07-27. Retrieved 2010-07-27. ↑ Daniel Kirn (2007). Stuttgart — Eine kleine Stadtgeschichte. Sutton. ISBN 978-3-86680-137-0. ↑ Stuttgart - Where Business Meets the Future. CD issued by Stuttgart Town Hall, Department for Economic Development, 2005. ↑ Paul Sauer: "Württembergs letzter König. Das Leben Wilhelms II. ", German. Stuttgart 1994. ↑ "Wuerttemberg". jewishvirtuallibrary.org. American-Israeli Cooperative Enterprise. ↑ Federal 1995, p. 88. ↑ "U.S. Army Installations in Stuttgart". US Army in Germany. ↑ "Contact." Contact Air. Retrieved on 21 May 2009. ↑ 22.0 22.1 22.2 Chen, Aric (2007-01-07). "Stuttgart, Germany; Motor Stadt (Psst! This Isn't Michigan)". The New York Times. Retrieved 2009-03-18. ↑ "Stuttgart". Encyclopædia Britannica. 2009. ↑ 27.00 27.01 27.02 27.03 27.04 27.05 27.06 27.07 27.08 27.09 27.10 "Stuttgart Städtepartnerschaften". Landeshauptstadt Stuttgart, Abteilung Außenbeziehungen (in German). Retrieved 2013-07-27. ↑ "Twin Cities". The City of Łódź Office. Retrieved 2008-10-23. ↑ 31.0 31.1 31.2 31.3 "Stuttgarter Stadtporträt/Städtepartnerschaften/Internationale Partnerschaften/Besonders freundschaftliche Beziehungen". © Landeshauptstadt Stuttgart, Abteilung Außenbeziehungen (Official website of Stuttgart) (in German). ↑ Tan, Paul. "Malaysia to get locally assembled S-class next year". Paultan.org. Retrieved 2010-10-09. Wikimedia Commons haes media relatit tae Stuttgart.